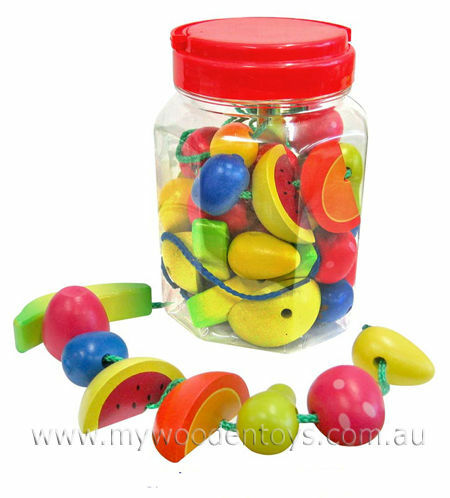 Wooden Lacing Fruit In Tub is a colourful 30 piece lacing toy with 2 long laces and a great selection of wooden fruit pieces. This lacing toy comes in a plastic screw top tub to keep it all together at pack up and storage time. This is a wonderful fine motor skills toy with nice big pieces for small fingers to create many fruit salads. As with all great toys this has multiple uses and is a really lovely way to teach types of fruit and colours. Material: Wood, Child-safe paint, Cotton laces. We like this because: "Our daughter said it was great for fiddly jiggly kids to keep them occupied."